The result - three years after the replacement. Determined partial rezorbziya bone grafting in the right maxillary sinus. 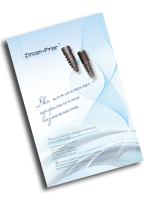 Integrated implants. 2 zirconia implant 3 years were closed (the patient did not show up for the reception). On radiographs - implants integrated. bottom: Preformed clasps clasp denture attachment. With poor hygiene, bone resorption occurred in the region. implants in the anterior region. Prof. cleaning is carried out since 2008. 6 months ago - a traumatic break off the superstructure of 46. Not asked for help. implant in region 46 is deleted.